Or Email me at katyrw@hotmail.com if you want to order in some other way. Geography has dealt Florida a lavish hand when it comes to natural gifts. The Sunshine State is filled with unusual flora and fauna. South Florida is home to the endangered Florida panthers and the only North America crocodiles. The Everglades swarm with wildlife from birds such as wood storks, ibises, flamingos, roseate spoonbills and dozens of others to mammals such as black bears, bobcats, fox squirrels and raccoons. When it comes to reptiles, you will find more alligators than you ever dreamed of as well as gopher tortoises, caimans, green anoles, five lined skinks and hundreds of other snakes, turtles and lizards. Take a boat ride into the surrounding waters of the Atlantic or Gulf of Mexico, you will find dolphins dancing in your wake. Drop on down to Big Pine Key, which is the only place you can encounter the tiny Key deer in the wild. You will probably spot a few sun-loving iguanas as you island hop through the Keys. South Florida’s plant life is also abundant and rich. From the native mangroves, which are at the root of the food chain to the colorful exotic Brazilian pepper, which threatens native plant life but seems impossible to eradicate to the delicate wild orchids, which thrive on air alone, your senses will be overwhelmed by the color and variety. Then there are also all the refuges, preserves, parks and zoos that make South Florida a nature lover’s paradise. Wild About Florida- South Florida is a guide no outdoorsman- or woman- should be without. It lists those hard to find places and provides the inside scoop on those magnificent spots you might never find on your own. 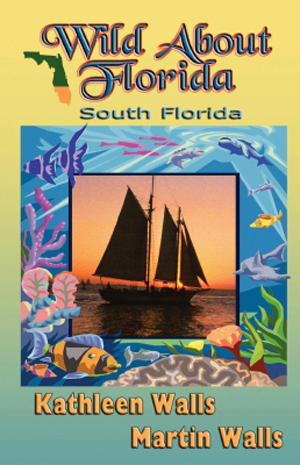 It portrays Florida’s wonders with original full color photographs. Even if you are not living or visiting the Sunshine State, this series is a great way to glimpse the wondrous natural side of Florida. Monroe County Monroe County is the southern-most county in Florida and includes those magic islands, the Florida Keys. This is where a nature-lover will find the really wide-open spaces and it provides everyone with a feeling that he has traveled and discovered to experience nature at its best within the comforts of Florida. Monroe County has an extraordinary number of state parks as well as numerous other natural attractions. Dagny Johnson Key Largo Hammock Botanical State Park offers six miles of back county trails through the lush hardwood hammocks. Their butterfly garden attracts many species of flying jewels. This is a hotspot for birds as well.Many migrant species are seen here including the thick-billed vireo and La Sagra's flycatcher. Lignumvitae Key Botanical State Park is another birding hotspot. Currently there is a pair of ospreys raising their young in a nest on an old windmill. Boating, canoes, kayaks and powerboats are welcome there. You can bring your own or rent from Robbie’s Marina or one of the other nearby outfitters. Robbie’s Marina also offers eco-tours to the island. Curry Hammock State Park is a group of island with both ocean and bay frontage. Human powered boats are allowed there and can explore both coastlines, as the current is not extreme. The park is going to offer year round camping there instead of just winter. As all of the Keys parks, this park is also a great birding spot. John Pennekamp Coral Reef State Park, on Key Largo, and San Pedro State Park, just south of Indian Key, are predominately underwater parks. At Pennekamp, the reefs are the major attraction. At San Pedro, you can dive around the remains of the San Pedro, a 287-ton, Dutch-built ship that was part of a Spanish flotilla. It sank in a hurricane on July 13, 1733. Today, a large pile of ballast stones covering an area 90 by 30 foot area mark the area of the wreck. The underwater site has been enhanced with seven replica cannons, an anchor and an information plaque. Indian Key Historic State Park, Windley Key Fossil Reef Geological State Park and Fort Zachary Taylor Historic State Park function mainly to preserve the rich and varied history of the Keys. They are also worth visiting for the wildlife and unique Keys flora they support. Bahia Honda State Park, at MM 37 offers the most activities of any state park in the Keys. There are three sandy beaches for swimming, snorkeling, fishing, kayaking or canoeing. It accommodates any kind of camping from large motor homes to the smallest tent at its 80 campsites. For those who don’t like to "rough it" there are cabins. The park has nature trails for hiking, paved roads for biking, docks for boating, a gift shop, a snack bar and a chance to spot more birds than the most ardent birder even dreams about. It is considered the best birding spot in the Keys as per the Great Florida Birding Trail Guide. The endangered white crowned pigeon has been spotted during the summer months. The big wading birds like herons, ibises and egrets are a sure thing. Long Key State Park, located at MM 67.5, also offers camping. There are 60 sites with water and electric hookups. A canoe trail and two hiking trails offer plenty of opportunity to spot wildlife. One of my favorite wild places in the Keys is National Key Deer Refuge, located on Big Pine Key. The attraction here is deer, the tiny Key Deer, found nowhere else in the world. Although they are found predominantly on Big Pine and No Name Keys, they can also be found on Cudjoe, West Summerland, Big Torch, Howe, Little Pine, Little Torch, Middle Torch, Sugarloaf, Annette, Big Munson, Little Munson, Johnson, Knockemdown, Mayo, Porpoise, Ramrod, Toptree Hammock, Wahoo and Water Key. Their liquid chocolate eyes will melt the hardest heart. No larger than the average German Shepard, these dainty creatures are protected here and you are sure to see them if you visit the right spots. Due to the appeal of the little creatures, people frequently break the law against feeding wildlife. Because of this, they have largely lost their fear of humans and will often approach you very closely. The population is believed to be between 300 and 800. They are a high risk due mainly to automobile crashes as they are hard to see especially at dawn and dusk. When you see the lowered speed limit on big Pine Key, remember just that few miles-per-hour slower may save the life of one of these threatened beauties. The Blue Hole, a deep borrow pit that’s a remnant of the old railroad days, is a wonderful spot to find wildlife. The tiny deer are not the only attraction here. Alligators, turtles and other creatures either live in or frequent the hole and the nearby Jack Watson Nature Trail. The Key Deer Refuge is on the Florida Birding Trail and it’s a great place to sight green herons and belted kingfishers. Look for the wonderful observation platform at the end of Manillo trail. Big Pine Key is also home to the Great White Heron Wildlife Refuge. The herons, great whites as well as blues and greens are not the only bird you may spot there. Frigate birds, cormorants, pelicans, egrets, ibises, bald eagles and ospreys are often spotted. Crane Point is located at Marathon by MM 50.5. Here you will be able to combine history, culture and nature. The center offers two museums, Museum of Natural History of Florida Keys and The Children’s Activity Center.